The second base slot has changed dramatically in this era. With all the strikeouts and flyballs there are fewer double plays, fewer ground balls, and if there is the shift complicates who is where. But I will not emphasize those changes, I just want to look at the names and skills of the people who players second in our history. field. The original Spark plug player who had so much drive he pushed everyone else too. He was the very first Minnesota Twin second baseman and played there 108 games in 1961. Another former manager, Billy Gardner, played 41 games, Ted Lepcio 22 games, Jose Valdivielso 15 games, Rich Rollins, Billy Consolo, Jim Snyder and Bill Tuttle also played multiple games at the position. By 1962, as often happened with Billy – he was gone and former Purdue QB Bernie Allen had the bag for every game! Allen was third in ROY ballots. In 1963 Bernie got some days off and only played second in 128 games. Johnny Goryl, another future manager, played there 34 games and to my great shock – VIC POWER – the outstanding fielding first baseman played second 18 times! 1964 looks like one of the first base years. Bernie Allen only played 71 games there, Minnesotan Jerry Kindall (future gopher coach) played 51, Johnny Goryl 28, Jim Snyder 25, and then Jay Ward, Bill Bethea, Frank Kostro and Bud Bloomfield rounded out the field of eight. 1965 and Jerry Kindall took over for 106 games and Frank Quilici played 52. Rich Rollins 16 and Bernie Allen 10, Frank Kostro 7 and Cesar Tovar 4. Tovar played everywhere and in one game he did play all nine positions. 1966 Bernie Allen had the most starts – 89 and Tovar was second with 74. That year Tovar also played SS, LF, and CF. Rich Rollins had 4 games there. 1967 Rod Carew took over and started 134 games, Tovar played 35, and Frank Quilici 13. 1968 Carew played 117, Quilici (49) beat out Tovar (19) for second place and Ron Clark played 9. 1969 Carew played 118, Tovar 41, and Quilici 36. The sixties had a variety of players and it wasn’t until Carew that we had a long term answer at the position. Martin started it, went to coaching, went to managing and then went elsewhere. Bernie Allen brought his football status for a while and Carew took over the position. Billy Martin played 11 years in MLB, the last one with the Twins. 246/.275/.361/.636 and (-1) WAR for that year. In 1969 he managed the Twins and then followed that up with 15 more managerial years. Following the Kindall model, Frank Quilici played for us five years as a second baseman with the line .214/.281/.287/.569 and a five year WAR total of (-0.5). So for those three players we have an accumulate WAR of (-4.5). Cesar Tovar deserves some recognition here. He was with us 8 of his 12 years with a line of 281/.337/.377/.714 and would be the best except he was never the starter at second. In all he earned 25.9 WAR with the Twins, but he played everywhere – his career totals for appearances are: OF (all three positions) 945; 3B 227; 2B 215; SS 77; DH 90; and one game at C, P, and 1B. So, the best of the sixties belongs to Rod Carew who plays 12 of his 19 seasons with the Twins. He hits - .334/.393/.448/.841, accumulates WAR 63.8 with the Twins, and he will play 1184 games at first and 1130 at 2B. Who starts the most in 1970? Danny Thompson 81, Frank Quilici 74, and Rod Carew 45 with Tovar, and Minnie Mendoza getting the rest. Order was restored in 1971 with Carew at 2b 142 games and Steve Braun there 28. Danny Thompson plays 3 and Tovar came in from LF to play 2. 1972 Carew and Braun are still one and two and three is Dan Monzon. Monzon and Terrell are Carew’s caddies in 1973. In 1974 Monzon is out, Terrell is two and Luis Gomez and Sergio Ferrer get the crumbs. !975 Carew continues to dominate the bag, the same old backups continue to share what is available. Then in 1976 there is a shakeup. Carew is at first and Bob Randall starts 153 games and Terrell 31, Gomez 8, Carew 7, and Cubbage 2. It seems strange to have Carew with so few, but this is the future. With open season at second Randall holds on in 1977 to start 101 games and a new name – Rob Wilfong gets 66 games, Gomez, Terrell, Carew, and Sam Perlozzo share the rest. In 1978 the order stays the same Randall gets 115, Wilfong 80, Cubbage 5, Carew 4. And the decade ends with Wilfong taking the lead 133 games, Randall 71, and Cubbage 1. 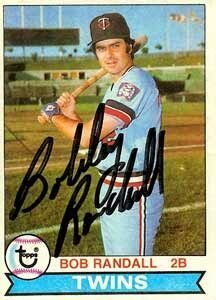 Randall plays five years for the Twins and has a 3.8 WAR with a slash line of .257/.310/.311/.621. Not bad for the position. The only choice for the decade of the seventies is Rod Carew – the same as the sixties. Rob Wilfong leads of the new decade at second base with 120 games at 2B and Pete Mackanin appeared in games. 1981 the same two dominated with 93 and 31. John Castino got in 4 and chuck Baker 3. In 1982 John Castino took over the lead with 96 and Ron Washington played 37. Larry Milbourne was in for 26 and Wilfong was only in 22. Castino was the only one to have a positive WAR that year at second. In 1983 had 132 games and Tim Teufel was second with 18 and Ron Washington had 14. Rob Wilfong was gone. Then Tim Teufel took over in 1984 with 157 and Ron Washington was his back up. Like the previous decades there was a constant turn over looking for the right guy. Teufel held on to 1985 with Ron Washington and Steve Lombardozzi splitting the rest of the appearances -26 and 24. Like the previous seasons the understood took over for the leader and Lombardozzi was the 1986 starter with Alvaro Espinoza (not related to the philosopher) as understudy. Ron Washington, Chris Pittaro, Greg Gagne, and Gary Gaetti all had a turn. Steve kept the starting position as the team headed to the world series in 1987 and Al Newman was his primary backup. Although Pittaro and Gagne got a taste of the bag. 1988 kept Lombardozzi in the lead, 90, but Tommy Herr appeared and was in 73. Of course, Tommy fits with the great, not necessarily positive, characters in Twins history. The Cardinals traded him for Tom Brunansky. This was not a bargain for us. The Argus Leader wrote, “Herr didn’t hide that he wasn’t thrilled to be in Minnesota, announced midway through the season he wouldn’t return in ’89, and batted just .263 with one homer. He spent half the season on the DL, and teammates and media questioned the seriousness of his injuries. He was traded to the Phillies for Shane Rawley and Tom Nieto after the season.” No one came close to whining and complaining about being in MN. He will not be considered for our best. Al Newman stepped in for him and Greg Gagne and an outfielder named Dan Gladden played second. The end of the decade the mix is really symptomatic of the 80s – now we start Wally Backman from the Mets. “Still uncomfortable with Steve Lombardozzi playing second and what seemed like a cast of thousands batting second, Minnesota sent three pitching prospects to the New York Mets on Dec. 7 for the 29-year-old Backman. Almost immediately, Backman announced that he was thrilled to be with the Twins and bought a house on Lake Minnetonka. "Tommy Herr never wanted to play here, so he didn't fit in with the rest of us," says first baseman and clubhouse leader Kent Hrbek. "Backman does fit in. You can see the difference just in the fact that Wally wants to have fun. Already, Backman and (Dan) Gladden are pulling pranks on each other." LA Times. Al Newman had the exact same number of games at second as Wally – 84, Doug Baker got in 25 times and Chip Hale 16. Where do I start looking for the best of this decade? John Castino played six years and lost his career on a bad back. .278/.329/.398/.727 and 15.2 WAR are pretty good, but he played 416 games at 3B and 232 at second. Tim Tuefel in three seasons with the Twins was .265/.342/.409/.751and 5.5 WAR looks okay. In 11 seasons he played 806 games at second. Steve Lombardozzi had a lot of promise, but produced .233/.307/.345/.652 and 4 WAR in four years. But to put it in perspective, the team was willing to trade Brunansky for Herr because they wanted to replace him. Rob Wilfong was with us six years - .262/.322/.360/.681 and 5.3 WAR for the Twins. In 11 years he was at Second 839 games. Wally Backman was in 87 games for the Twins, he does not qualify. I know it is not a well-remembered name, but Tim Tuefel was the second baseman of the 80s and that is a statement about the team and the decade. Al Newman began the decade with Fred Manique (a name I cannot remember) playing a significant number of games in reserve. Nelson Liriano also played many games at second. In the one game category were Chip Hale, Doug Baker, and OF – Kirby Puckett! Al did not keep the starting job, in 1991 our last WS championship year we found a second baseman to make us forget the 80s and perhaps at the end also forget Tommy Herr. His name was Chuck Knoblauch. Al Newman was backup and I always enjoy the scrubs at the end of the list – this time they are Gene Larkin (you got to be kidding) and Mike Pagliarulo. Or Course Knoblauch kept the position in 1992 and Jeff Reboulet was his primary backup. Donny Hill got in two games and so did that Kirby Puckett character again. Knoblauch again dominated 1993 with Chip Hale behind him, Reboulet next and Denny Hocking making a token stop at second. The same top two in 1994 with Jeff Reboulet. 1995 was the same but the scrubs were Brian Raabe and Puckett again. 1996 continued the stability with the same top three and then Todd Walker appears, Hocking and Raabe. In 1997 the only change were in number 2 and 3 – Hocking and Walker moving up. 1998 breaks up that lovely consistency and Todd Walker with all the promise in the world took over at the bag and Knoblauch was on his way to the big Apple from the Minneapple. Hocking and Brent Gates were two and three. The same three finished the decade with someone named Cleatus Davidson as the scrub. I am afraid there is no doubt – this decade was Knoblauch’s. His line was .304/.391/.416/.807 for seven seasons with a WAR of 38. He was on his way to a potential HOF career until he got the yips in NY. Todd Walker the heir apparent would have five years in MN with 285/.341/.413/.754 and 1.8 WAR. Like Ortiz he did not get along with Kelly’s ideas and seemed to be disliked for his college degree. He would play 12 years and get 10.5 WAR so he never achieved his first round draft expectations. The new best second baseman was Jay Canizaro 90, Hocking 47, Jason Maxwell 30, Todd Walker 19, and Luis Rivas 14. Luis took over in 2001 with Hocking behind him and Jason Maxwell behind him Rivas was still the leader with 93 games in 2002, with Hocking, Canizaro, and the scrubs were Warren Morris and David Lamb. The Rivas years solidified in 2003 with Luis starting 134 games and Hocking, was followed by Chris Gomez, Alex Prieto, Michael Cuddyer, and (this must be a joke) Mientkiewicz. In 2004 Michael Cuddyer moved up to second at second with 48 games there. Augie Ojeda, was third followed by the famous Nick Punto! Jose Offerman and Jason Bartlett got token games too. You could see it coming. In 2005 Rivas was second at second and Nick Punto was first. Behind them were Luis Rodriguez, Brent Abernathy, BRET BOONE, Michael Cuddyer and Juan Castro (no relation to Jason that I know). Luis Castillo played in 142 games in 2006, Followed by Punto, Rodriguez, Alexi Casilla. In 2007, Castillo’s days were numbered as we got into another scrum at second. Castillo 85, Casilla 52, Punto 25, Rodriguez 21. Alexi Casilla was the primary starter in 2008, followed by Brendan Harris, Nick Punto, and Matt Tolbert. Then some appearances by Matt Macri, Brian Buscher, and Howie Clark. Alexi was in the next scrum – 2009 with 72 games, Punto 63, Tolbert 36, Harris 11, and one for Cuddyer. Carew and Knoblauch were easy. Here is another tough choice. Nick Punto was with the Twins seven years - .248/.323/.324/.648 and 10.3 WAR While he played all over, his 408 games at second are the most of any position in his 1122 games played. Jay Canizaro .255/.308/.373/.682 for two years and (-0.4) WAR. Luis Rivas was with the Twins 6 of 8 years. .262/.307/.383/.690 (-0.9) total for those six years. Luis Castillo played 2 of his 15 years with the Twins. .299/.357/.363/.720 and 3.7 WAR for those two years. Base on WAR Rivas and Canizaro are out. Nick Punto was more productive in the same number of years than Casilla so I have to say that Luis Castillo was the best of the decade. Orlando Hudson began our last decade with 123 games, Alexi Casilla had 24, Matt Tolbert 20, Nick Punto 12, then Plouffe and Cuddyer and Harris. 2011 was another scrum, we obviously were looking for something – Casilla 56, Hughes 37, Tolbert 36, Cuddyer 17, Plouffe 17, Brian Dinkleman 11, and Nishioka 6. 2012 Alexi Casilla was back on top with 95, Jamie Carroll had 66, Eduardo Escobar 8, Plouffe 4, Hughes 3, Nishioka 3, and Darin Mastriani 1. In 2013 Dozier took over and was at second for 146 games. Jamie Carroll, Doug Bernier, Mastrioanni finished up. 2014 Dozier had 156 games and Escobar, Bernier, and Nunez had the rest. In 2015 the dominance was established and the same names appeared. The same was true for 2016, except the other names included Polanco, Danny Santana, and James Beresford. 2017 was the same except the other guys were Adrianza, Escobar, Goodrum (now a Tiger), and Santana. There is no real discussion here. This is Dozier’s decade. .248/.325/.447/.772 and 23.9 WAR. The choices come down to Rod Carew who plays 12 of his 19 seasons with the Twins. He hits - .334/.393/.448/.841, accumulates WAR 63.8 with the Twins, and he will play 1184 games at first and 1130 at 2B. Or Knoblauch.304/.391/.416/.807 for seven seasons with a WAR of 38. I would take Carew/Knoblauch/Dozier and there is no 4 or 5. Compared to 108 first base candidates there were 77 men who played at second. Thanks for doing this, mike. Brings back a lot of memories from say, '69 to the present. John Castino was on his way to a fine career with both the bat and the glove. Too bad he couldn't stay healthy. I did not know that Billy Martin actually played for the Twins. But in checking on that, I discovered he was traded to the Twins part way through the 1961 season, so Billy Gardner actually started the 1961 season as the Twins second baseman. I agree with Carew/Knoblauch/Dozier probably in that order. I do think Alexi Casilla was an exciting player although he didn't play full time nor a lot of second base. → The Twins best second baseman.